Today, Budweiser is unveiling a tribute film, “This Bud’s for 3,” honoring Dwyane Wade’s upcoming retirement, celebrating not only his incredible athletic achievements but most importantly his impact and legacy off the court. 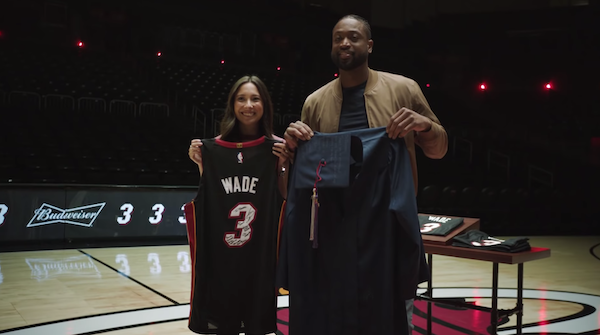 The film takes Dwyane’s season-long jersey swap ritual to the next level as he comes face-to-face with some of the fans he’s impacted the most throughout his career – each ready with their own “jersey” to swap with him. To watch the video: CLICK HERE! Print article This entry was posted by Art Eddy III on April 9, 2019 at 1:54 pm, and is filed under Sports. Follow any responses to this post through RSS 2.0. Both comments and pings are currently closed.